Is This Really a “Trump” Rally? The latest market surge, as the Dow powers toward 20,000, is being called the “Trump stock market rally.” But as an economist and a realist, I have to question whether stocks would rally this much just on hope and expectations for a new administration, without the help of some other catalyst. My point here is not to be political. Politics and economics are two very different animals who have to play nice in the jungle. But I do believe that this rally would have occurred no matter who won the election, based on the strength of the current economic fundamentals. This is not meant to take anything away from President-elect Trump’s plans. Some investors are interpreting the Trump agenda as being supportive of the economy. There are some proposals, however, that could hurt stocks, such as limitations on international trade. In addition, increased spending and lower tax revenue could lead to a larger deficit, while policies that could lead to accelerated interest rate hikes would make it harder for corporations to float debt. And for all his ideas that could stimulate growth (e.g. infrastructure investments) at least in the short run, keep in mind that it takes a lot for anyone to execute a plan into action. As an aside, it’s interesting to note how names get associated with certain things to describe or define them in some way. Think Watergate of the Nixon era; now any conspiracy or controversy is the next “Something-Gate”—immediately conveying a meaning, and a negative one at that. Health care reform—officially known as the Patient Protection and Affordable Care Act—is nicknamed Obamacare for the president who made it a policy hallmark. Ronald Reagan’s economic policies were dubbed Reaganomics. And the list goes on. Now, as we head to Inauguration Day in January, Trump appears to have his first label whether he deserves full credit for it or not: the Trump stock market rally. But let’s be clear: This rally, as I see it, is not just built on hopes for what might happen with the new administration. Rather, it reflects what is already happening, namely improvements in economic fundamentals. 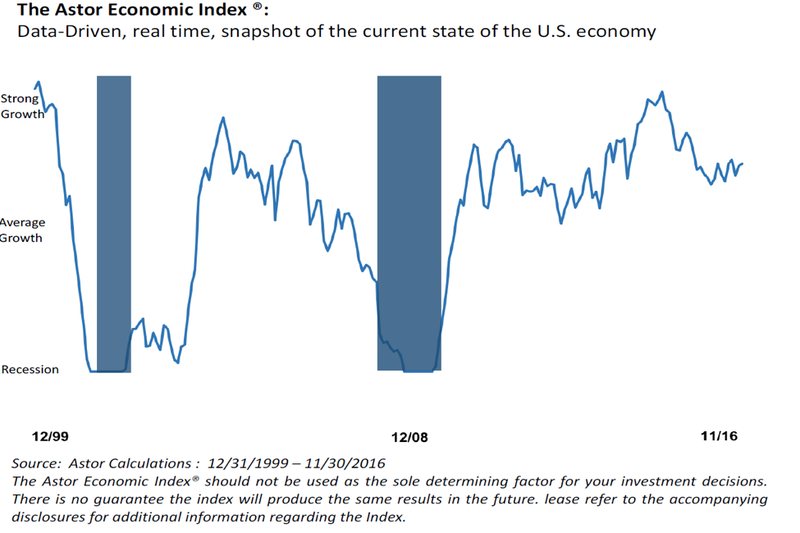 The Astor Economic Index® (AEI) is showing the economy growing at an above-average rate. Unemployment continues to drop, with a current rate of 4.6%, the lowest level since mid-2007, while wage growth has also been rising steadily. GDP has improved, particularly in the second half of the year. Inflation, which has been negligible, is moving toward the Federal Reserve’s 2% target. And, the Federal Reserve appears to be giving a vote of confidence to the economy with a widely expected short-term rate hike. Globally, the economic picture appears to be bottoming out after a prolonged period of malaise, and growth is starting to tick up. No matter what the stock market rally is called or who gets credit for it, I believe it’s important to view it in the context of fundamental realities: U.S. economic growth is accelerating, an environment that we, at Astor, believe to be supportive of buying stocks and other risk assets.